The Sac County Sheriff’s Office has a new deputy. Deputy Katie Brown was sworn in Tuesday as a Sac County deputy sheriff by Board of Supervisors chairman Rick Hecht. Brown is a Marine Corps veteran and recently graduated from Morningside College. 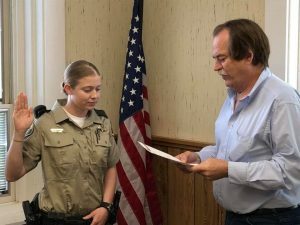 Brown will be in a 12-week field training program and is scheduled to attend the Iowa Law Enforcement Academy in August.